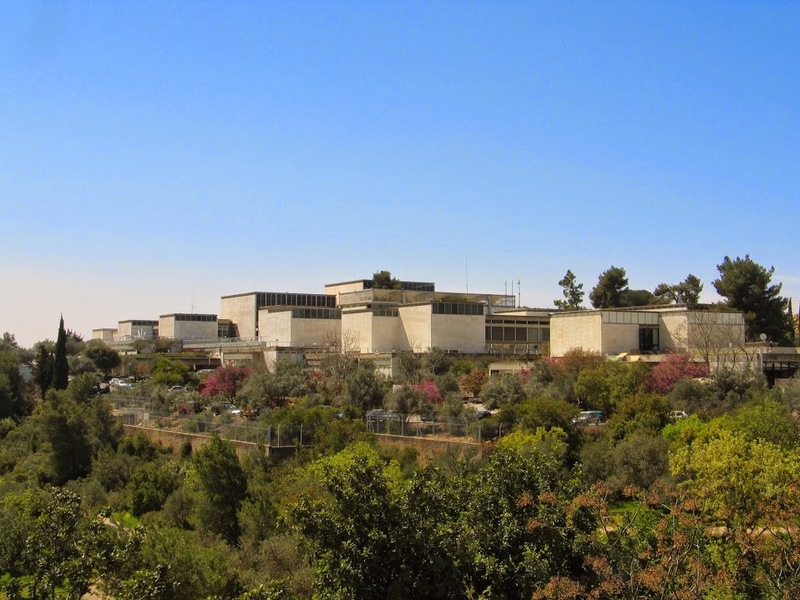 The National Library of Israel: symbolism or urbanism? 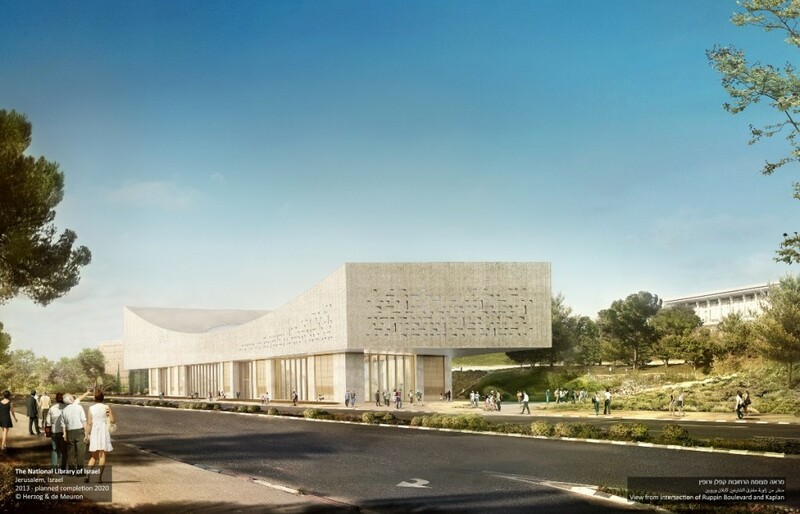 The cornerstone was laid last week for the new National Library of Israel building — a smooth, modernist crescent of limestone-compound and glass that is destined to take its place within a monoculture of standalone tourist attractions, in that part of Jerusalem known as Kiryat HaLe’om — the National Quarter. The media buzz about the new National Library building is very upbeat, and populist. A major cultural institution is being moved from its secluded setting within a gated university campus to a freely-accessible quarter of the nation’s capital — a win for the common man. While we’re rejoicing over that, we can also exult in the sleekness and poshness of the future structure’s design, its generous skylit reading room. 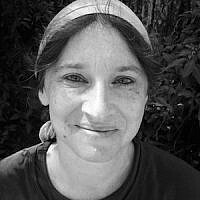 The talk is upbeat; but something has been left out of the conversation. More than half a century ago, Jane Jacobs cautioned against creating “decontaminated” cultural districts and made a compelling case for the strategic deployment of cultural and public buildings as “chessmen,” to enhance the vitality and diversity of different city areas. This approach would view the concentration of major museums and cultural facilities in a single, dedicated compound not only as a problem for that area, but as a loss for the city as a whole. Will even the most gluttonous culture vulture, the most rapacious tourist, want to visit both the the future National Campus for the Archaeology of Israel and the National Library of Israel on the same day? 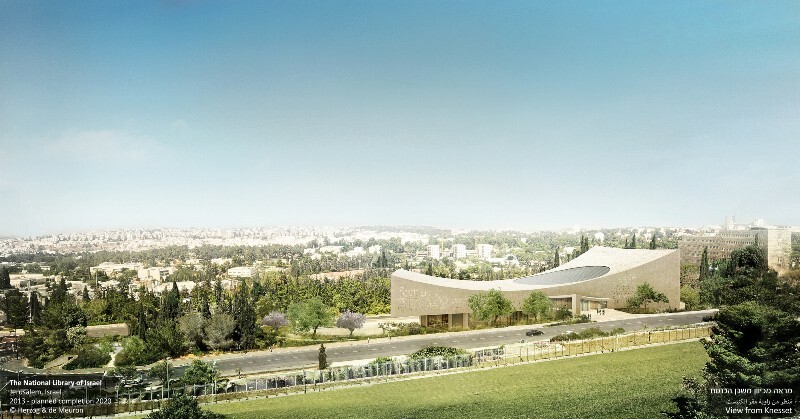 Will Israel’s future Nature Museum benefit from proximity to the Knesset? Jerusalem the city, or Jerusalem the symbol? In our suburban-sprawl world, Jacobsian urbanism has hardly been implemented; yet there is a backlash. I’ve heard it argued, for instance, that because Jerusalem is hilly and lacks an egalitarian street grid, it represents a different kind of urbanism that needn’t emphasize the diverse street over the dedicated compound. This is hardly the case with Jerusalem’s National Quarter, where the existing and future museums and cultural/governmental buildings are scattered and surrounded by “greenspace” that is more buffer than usable park. Likewise, the Israel Museum underwent a hundred million dollar renovation a few years ago that, as I have noted elsewhere, both accommodates and reinforces the Museum’s anti-urban quality. Translation: We know that Jerusalem’s so-called National Quarter is an urban disaster, but we have an opportunity to design an iconic building there and will grasp at it no matter what. As part of the National Library’s cornerstone-laying events, one of the architects, Jacques Herzog, delivered a public lecture on the project. The lecture provided a fascinating glimpse into the starchitecture process. 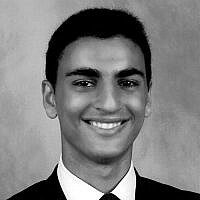 I was able to relate to the inner logic driving the genesis of the soon-to-be-iconic building. It’s like responding to the inner logic of any other element of the built environment — a prison, a big box store — that is not meant to be integrated into a functioning streetscape. Once you accept the premise of “freestanding” buildings “primarily linked by vehicular traffic,” you simply proceed with your bird’s-eye — or windshield-eye — view. 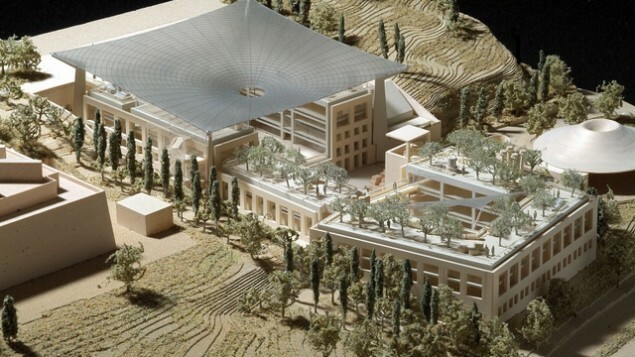 You talk about your building’s “urbanistic contribution” in terms of its “gesture” to the area’s “two main players” — the Knesset and the Israel Museum. You do this with a straight face. Surprisingly, the lecture actually left me with doubts about the building’s interior — which, on the face of it, should be entirely separate from its urban contribution. 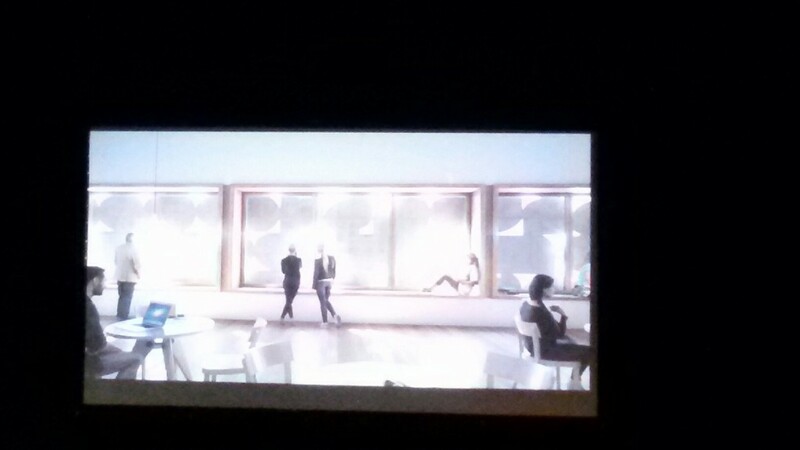 The renderings certainly give the impression of a luxurious, handsome, bright and airy space for users. Yet the architects appear to have been stymied by the difficulty of making windows in the building’s limestone-and-concrete upper portion. Their unwillingness to “violate the purity” of the “totally opaque object” — the sculptural mass that gives the building its iconic quality — led them to a rather weird solution: making a latticework of small, irregular perforations in the sculptural mass. But an interior rendering, projected on a screen during Mr. Herzog’s lecture (my apologies for the photo’s poor quality) shows a problematic internal environment. Wouldn’t it be oppressive to be surrounded by these window “teasers”? 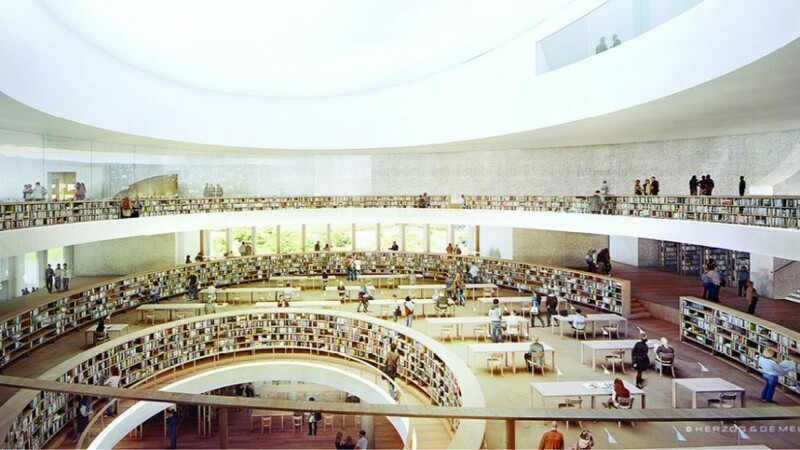 In the rendering, library users are entranced by the perforations; but is it really human nature to prefer oddly-shaped slits to actual windows? Wouldn’t the perforations be a constant source of visual frustration? 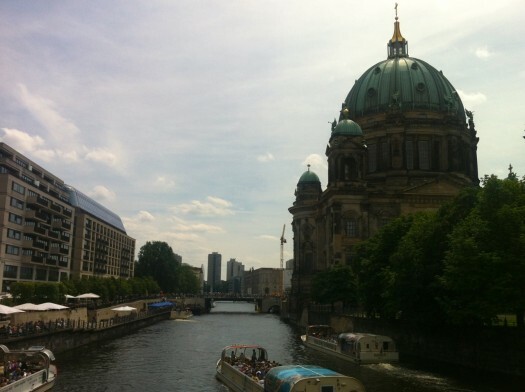 I guess this is what comes of valuing icons and symbolism over traditional urbanism. Even something as basic as a window can’t be taken for granted.